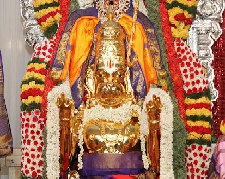 As part of Sri Hanuman Jayanthi celebrations, it is our pleasure to inform about the Shobha Yatra that is being planned on Saturday April 20, 2019 between 7.30 AM and 10.30 AM. On this auspicious occasion, Lord Hanuman procession will be held and all devotees are invited to participate and seek the protection and blessings of Lord Hanuman. The Shobha Yatra will commence and culminate at Sri Hanuman Mandir. The route that will be taken is as shown below.